NEW YORK, NY--(Marketwire - September 15, 2010) - Of all the various alternatives to fossil fuels such as ethanol, hydropower, and solar thermal energy, wind energy may have the longest history. People began to harness wind power for grinding grain and pumping water as early as the third century B.C. With today's high demand for low-carbon electricity, wind energy has found a new importance. Wind energy will surely be a part of the carbon-free energy future, and copper will play a large role in making that possible. Copper is indispensible to the proper functioning and efficiency of wind turbines. The metal plays a central role in the inner workings of the generator, grounds the towers from lightning strikes, and carries the electrical current where it needs to go. In addition, copper is one of the most recyclable metals available, which makes it well-suited to contribute to energy development that is environmentally friendly. Inside the familiar white shell of a wind turbine, is where the spinning of the blades turn into the energy that we use. This work is done by an electrical generator that transforms the motion of the turbines into electricity. The copper in the generator helps turn the natural energy of wind into power that consumers can use and afford. According to Dr. Ned Brush, an energy efficiency consultant with BBF & Associates, "Copper is the most cost efficient metal for generators because it is extremely conductive." Copper also helps move the electricity along on its way to the consumer. After electricity is created in the generator, it travels through copper cables down to the base of the turbine, where it passes through switch gear on the way to a transformer. Each turbine has its own transformer; the electricity from each transformer passes along through more copper cables on its way to a common collector. "Copper has always played some type of role in sustainable and alternative energy," said vice president of Copper Development Association, Robert Weed. "Copper has so many unique characteristics that fit perfectly for what is needed in wind turbines." 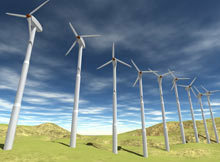 Copper has another ancillary contribution to wind power, it is used to ground wind turbines from lightning strikes. Since wind farms are typically located in wide-open areas, they are especially vulnerable to storms. The rotating blades are further subject to static electricity build-up. A copper wire in the blade is used to dissipate this energy. Not only does copper play an important role in this sustainable energy technology, it is a sustainable material itself, and is often referred to as the most recyclable metal. Manufacturing copper products is also energy efficient, Dr. Brush estimates that the carbon output required to produce copper for a single wind turbine is offset in 3-5 days by the very same wind turbine and a generator made of copper can have a life span of up to 15 years. These are significant benefits in the development of renewable energy. Copper is an essential element in making wind a feasible energy source. It has played a significant role in the history of industry and will continue to be indispensible to energy production in the future.